Historical Fiction in English and Social Studies Classrooms: Is It a Natural Marriage? Summary: What happens when history and ELA teachers form a study group to develop understandings of disciplinary literacy and ways this new knowledge might affect each person’s practice? As members read and reflected together on historical fiction and nonfiction, they found that reading texts from both disciplines helped to more fully contextualize a historical period and promote historical empathy. This piece could generate ideas for forming similar study groups and provide an opportunity for teachers to delve into questions and issues related to disciplinary literacy within a professional development forum. 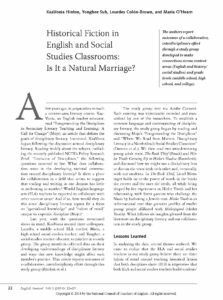 Download “Historical Fiction in English and Social Studies Classrooms: Is It a Natural Marriage? We also found that when using historical fiction in their classrooms, teachers of both subject matters wish to promote another key habit of mind: historical empathy, which needs to be built upon contextualizing the historical period. In English, it has been suggested that young adult fiction ‘can offer a connection to alienated students, mirror the lives of young adults and provide a forum for adolescents to discuss what it means to come of age, including navigating difficult problems, accessing tools needed to become problem solvers, and fostering empathy’ (Bucher and Hinton 10; Stallworth). More specifically, historical details build empathy and help students understand why characters in historical novels make certain decisions, thus humanizing historical periods and events (Bucher and Hinton; Nawrot). Would you recommend this resource to others? The National Writing Project focuses the knowledge, expertise, and leadership of our nation’s educators on sustained efforts to improve writing and learning for all learners. Visit us at www.nwp.org or email us at nwp@nwp.org.